After 93 years of caring for others and serving the Lord, Addie “Granny” Frazier, passed away early Monday morning, January 28, 2019. She was born in Madison County on March 8, 1925 to the late Ed and Crissie Rector Rhodus. 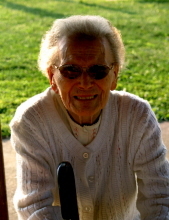 Addie was a former Westinghouse employee and enjoyed cooking for her friends and family. She also like to quilt and make doll dresses. Addie was a long time and dedicated member of the Newby Baptist Church where she also served as a Sunday School teacher for several years. Funeral Services will be conducted at 7:00 PM Thursday, January 31, 2019 at the Combs, Parsons & Collins Funeral Home, W. Main St., Richmond, with Bro. Scott Guiley officiating. Private Burial will be in the Madison County Memorial Gardens. Visitation will be after 4:00 PM Thursday, at the funeral home. The Combs, Parsons & Collins Funeral Home is in charge of the arrangements. "Email Address" would like to share the life celebration of Addie Frazier. Click on the "link" to go to share a favorite memory or leave a condolence message for the family.